DragonForce is a power metal band that was formed in 1999, from the remnants of black metal band Demoniac under the name of DragonHeart. However, the band soon changed its name to DragonForce before releasing any commercial albums due to possible commercial issues with Brazilian band DragonHeart. Their career began with publishing of songs on the first incarnation of MP3.com, claiming the top of the site's heavy metal charts. The hit song Valley Of The Damned reached over 500,000 downloads in the first few months. Despite this, two of the original members, Steve Williams and Steve Scott left the band to form power metal outfit Power Quest. The band has enjoyed increasing popularity over the years, publishing four albums and touring extensively while supporting artists such as Helloween, W.A.S.P. and Iron Maiden. Their 2005 tour in support of the Sonic Firestorm album included support from Angra and Mendeed during their passage through the UK. On October 28, 2005 bassist Adrian Lambert announced his departure from the band. (Lambert later revealed in an interview that he had left due to musical differences with Herman Li and Sam Totman). 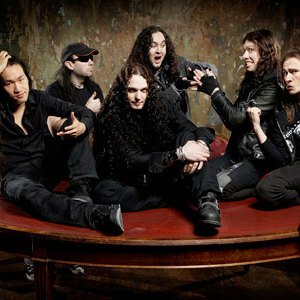 Less than a month after Lambert's departure, on November 23th 2005, DragonForce was signed to Roadrunner Records which released their album Inhuman Rampage in 2006. Lambert was replaced in 2006 by Fr?d?ric Leclercq, who was made an official member after a performance on tour. DragonForce's Through the Fire and Flames is featured as an unlockable bonus song in Guitar Hero III: Legends of Rock for PS2, XBOX360, PS3, Wii & PC. Not including downloadable content, it has been widely perceived as the hardest song in the Guitar Hero franchise.